What are your thoughts on Virtual Puja? Re: What are your thoughts on Virtual Puja? They already offer not virtual puja....but live puja thru web-cam too. I have not checked the whole site but you might find something interesting. e-puja is not at all equivalent to traditional puja..its a farce..but fo people lyke me who hate to go to the temples owing to the presence of desiz and their irritating by-products (kids), have no otha option.. Virtual Pooja on the internet is not much logical. If one has to do virtual pooja, it can be done anywhere with closes eyes. Last edited by pandeyypoojaa; December 26th, 2016 at 06:49 AM. Virtual Puja? wow...why didnt i think of it sooner. its a good business. Physical Puja, Virtual Puja, Live Puja etc etc aee useless unless you are connected. All that matters is how much focused you are. Just remembered that people in South India are devotees of Lord Shaligram, which is just a shelll from Sea. Kagaz ki naav ! – Bhav-saagar kya khaakh paar karegi ? Ki,…... Khooshboo aa nahin sakti, kabhi kagaz ke phoolon se ! It’s like taking a bill-board of aishwarya and do w/ it, rather than a real girlie,..
Be real and leave da Virtual world,..
Have real flowers in that flower vase,….. artificial instead,…. Also eat real rice and say NO to Japanese rice and Plastic baby Dolls,.. I agree. Unless you are connected (to a wi-fi network), physical/live pujas can tend to get very boring... and virtual pujas are impossible. ^^ U sure? Bhai,... mere khyaal se,.. virtual pooja ko vaaste, connected hona jaroori nahin,..
Waise bhi, BF ya GF se thori hi pooja hoti hai aise, bhala ! Logsanyaas pai, you are confusing moorthi-pooja (idol pooja) with virtual pooja. Moorthi pooja has been going on for thousands of years. The images have just gone from clay to digital... but pooja is same. Virtual pooja is a completely different concept. Please google and learn. Virtual Pooja/ Perform Poojas On Your PCs! Pooja is a sacred practice performed on different occasions to worship, pray or show your due respect to the God. 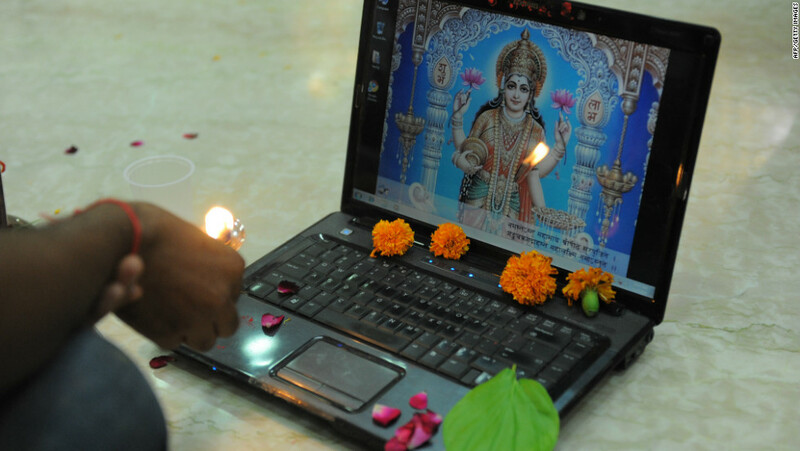 ... AstroVed brings to you, a virtual pooja where you can spend just a few minutes over your PC to perform a pooja! That was exactly my understanding,.. what was wrong ? Both are same. Both are scam to make money. In fact religion is biggest scam. Cant' you have a JPEG pictures' images of Dev-Devis on your desktop, / even YT' s aarati's mp3 video clips / Satyanarayan Katha's video of clips stored on desktop,....and perhaps no need of internet,... as I explained in a picture of Laxmi devi,..earlier ?